Thank you to Champion for providing me with a product to facilitate my blog review. With the cold weather we’ve been having lately, I’ve been increasingly preoccupied with the fact that we’d be vulnerable in case there was a power outage. Obviously, we need to have the heat on, but there’s also our food that could spoil, and almost any every day task would become a challenge without electricity. We’ve had power outages where I live that damaged the power lines so badly that people didn’t have electricity for weeks! Most people had to be relocated because with the cold, it just wasn’t safe to stay in their home. The simple solution is to have a generator. But not all generators are created equal! If you really want something reliable and efficient, you want to look for the Champion 3500-watt dual fuel generator and here’s why! It is a portable generator that can be set up within minutes which is exactly what you need when there’s an unplanned power outage. It even has wheels to be able to maneuver it around (it’s a neat feature because it’s not a light piece of equipment!). In terms of noise, I was quite pleased to discover that this generator emits about 68dBA from 23 feet which is about as loud as a vacuum. It provides 3500 watts of power which is definitely what you need for a house because you’ll want to power up a few things at the same time and it needs to be powerful enough to run some appliances, including a fridge. There’s 4 outlets on the generator: one 120V 30A RV outlet, one 120V 30A locking outlet, and two 120V 20A household outlets. There is also a Volt Guard feature on this generator that protects equipment from voltage spikes and overloads which means your valuable appliances are protected at all times. The other very practical feature is that it runs on dual fuel, meaning the 224cc engine can run either on gasoline for about 9 hours or on propane for about 10.5 hours. It’s easy to start up and thanks to Cold Start Technology, you can rely on this generator to start even in cold weather. Champion also offers standby generators which constantly monitor your home’s electrical supply. They start automatically and provide electricity to your home as needed by being connected to your natural gas line. Champion products come with a great warranty. In the case of this 3500-watt dual fuel generator, there is a 3 year limited warranty with free lifetime technical support for added piece of mind. 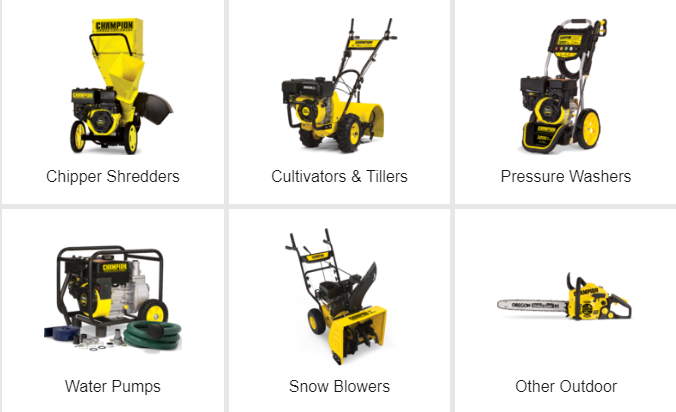 For those who aren’t familiar with the Champion brand, they also offer log splitters, chipper shredders, cultivators and tillers, pressure washers, water pumps, snow blowers and more! I’m so pleased to have this dual fuel generator in case of emergency. I know that my family and I will be safe and won’t ever have to worry about being left in the dark! 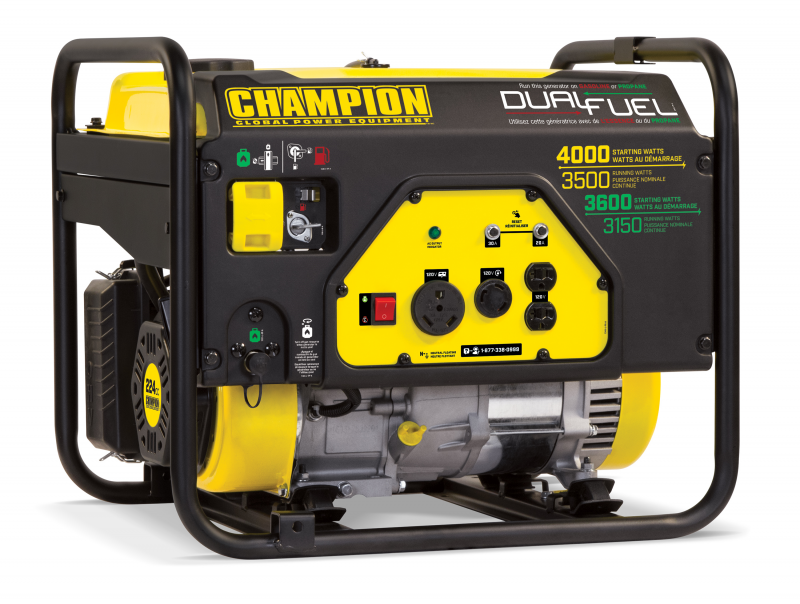 Find Out More: Head over to the Champion website for more information about this great dual fuel generators and all their other power equipment. They can be purchased in Canada at Canadian Tire, Costco and TSC Stores. Connect: Don’t forget to like Champion on Facebook and follow them on Instagram, YouTube, and Twitter for all the latest news, project ideas, and promotions. Win It: Champion is kindly offering our readers a $50 gift card from Canadian Tire where you could buy your own Champion generator! The contest is open to Canadians, until December 18th. Good luck! It would be wonderful to have a backup generator. We have made it through a couple of power outages with the help of a neighbors generator. Just to have a light and your fridge working is a big help. Anything! We do have a Champion generator. However, it is not duel fuel. Granted using gasoline you’d have to use it outside and run the cord/plug outdoors from inside to plug in, or put in the garage with the door slightly up. That way you’d have no chance of fumes building up in your home. The one we have has been a very good quality for the money. Well, that’s my opinion at least. Not entering the giveaway though, just giving an opinion.